Standby Say You! 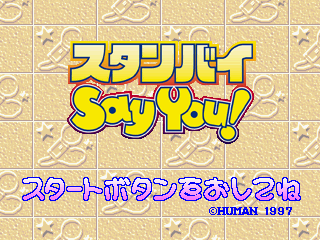 (スタンバイ セイ ユー) is an adventure game developed by Human for the Sega Saturn. There are three cover art variants of this game. Main article: Standby Say You!/Magazine articles. SAY_ABS.TXT TXT (Abstract) 189 About this game. Japanese Wikipedia page for Standby Say You!